Protected by a three-and-a-half-mile-long spit called Ediz Hook, Port Angeles Harbor is the northwest’s deepest harbor. At the far end of the spit, driftwood was burned atop a tripod by private enterprise as early as 1861 to provide light for navigation. That same year Victor Smith, who would play a large role in the history of Port Angeles and Ediz Hook Lighthouse, arrived in Washington Territory. Appointed customs inspector in 1862, Smith proceeded to force the removal of the U.S. Customs House from Port Townsend, where it had been for nearly ten years, to Port Angeles. After the residents of Port Townsend resisted his plan, Smith sailed into Port Townsend Harbor aboard a ship, and with the guns pointed at the Customs House demanded the records. Though Port Angeles had a population of only ten, Smith, with the backing of Salmon P. Chase, President Lincoln’s Secretary of the Treasury, was successful in establishing it as the port of entry. 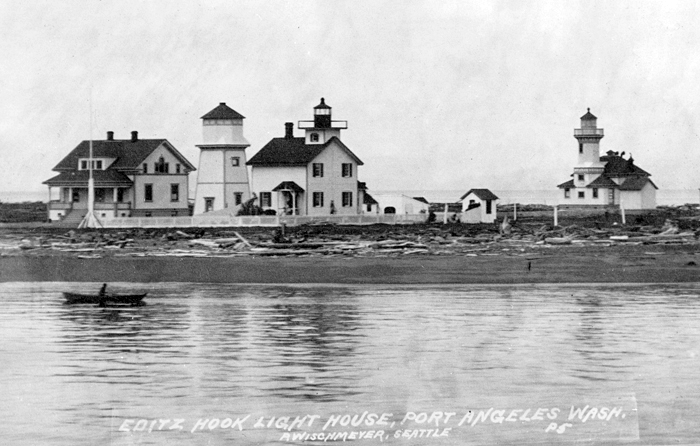 Included in Smith’s plan for Port Angeles was the establishment of a formal lighthouse on Ediz Hook. In 1862, President Lincoln signed an executive order reserving the end of the spit for government purposes, and in 1863 Congress provided $5,000 to replace the bonfire beacon on Ediz Hook with a formal light. In late 1863, a landslide in the nearby Olympic Mountains created a dam that later burst on December 16 and sent a torrent of water rushing downstream toward Port Angeles. 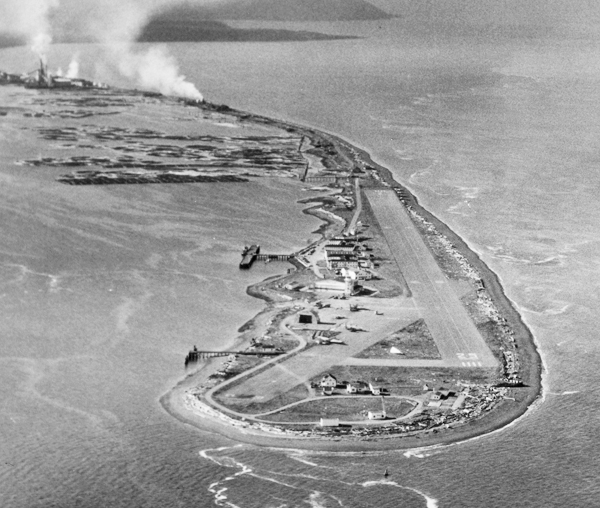 The tiny settlement was mostly destroyed, and its new Customs House was swept out into the Strait of Juan de Fuca along with two custom house deputies. The future of the town was in question for some time, but the Lighthouse Board eventually decided to proceed with the planned lighthouse. When completed, the lighthouse resembled a country schoolhouse, consisting of a two-story dwelling with a short, square tower protruding from one end of its pitched roof. A fixed, fifth-order Fresnel lens, with a focal plane of forty-two feet above the surrounding water, was first shown from the lantern room on April 2, 1865. 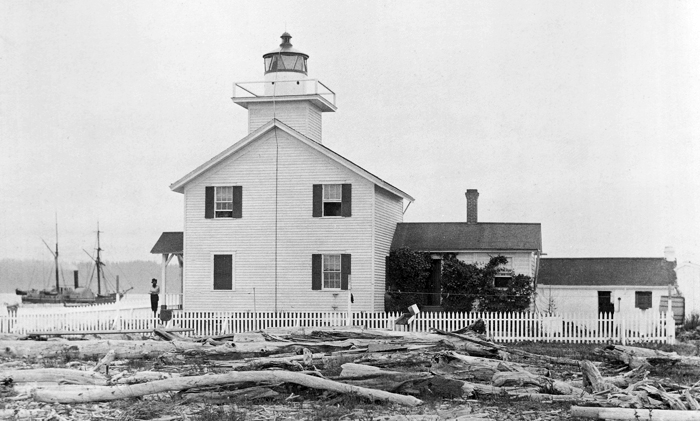 As customs inspector, Victor Smith was also in charge of appointing light keepers, and not surprisingly he appointed his father, George K. Smith, who has been serving at Cape Flattery Lighthouse, as principal keeper, and his sister, Cynthia, as assistant keeper. Cynthia served just a few months as assistant before George’s wife Nancy assumed this role and served until her death in 1869. George Smith continued to serve as head keeper until 1870, when Mary Smith, his daughter, took over the responsibilities of head keeper. In 1874, Mary Smith and Ella, her sister and former assistant, moved to California, where they became the first head keeper and assistant keeper of Point Fermin Lighthouse. Eighteen-year-old Laura P. Balch, who had been serving as Mary Smith’s assistant for nearly a year, was promoted to head keeper of Ediz Hook Lighthouse in October 1874. Captain Thomas Stratton, a customs inspector from Port Townsend, started to pay regular visits to Laura at the lighthouse, and Laura soon had a new last name and a new assistant keeper. Thomas passed away in March 1885, and Laura was removed from office the following November. The station’s light was converted from lard oil to mineral oil in 1880, and the following year a detached, brick oil house was built to contain the more volatile oil that was delivered to the station in five-gallon tin cans. A pyramidal-shaped fog bell tower, fifteen feet square at its base and thirty feet tall, was built roughly 300 feet seaward of the lighthouse in 1885. A one-and-a-half-ton bell was suspended from support beams near the top of the structure, and a clockwork mechanism struck the bell once every fifteen seconds in foggy conditions. In 1897, the fog bell was placed on a gallows frame to raise it higher off the ground, resulting in a small increase in the range of the bell but not as much as was hoped. Authorities were convinced that “some local peculiarity” made the bell inaudible in certain directions and felt that a bell of a different tone or a machine that struck a heavier blow might solve the problem. A stronger striking mechanism had already been installed in 1889, at which time the old one was sent to Warrior Rock Lighthouse. 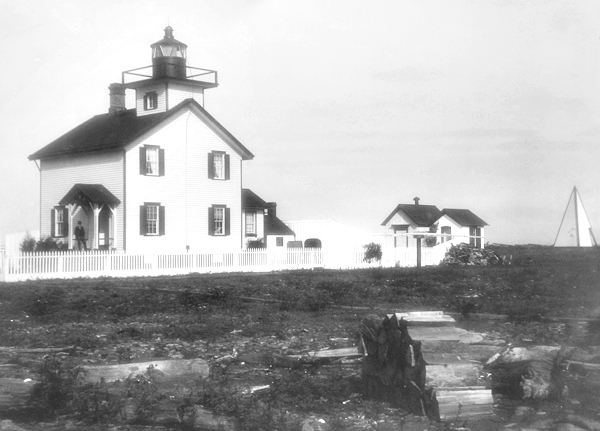 By the turn of the century, the combination dwelling/lighthouse was in need of repairs and mariners had repeatedly complained about the coverage of the fog bell. 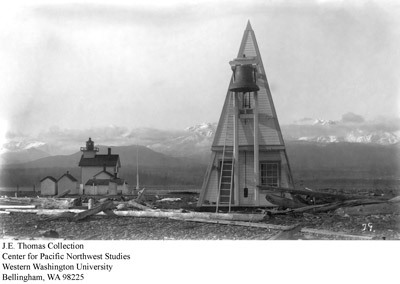 To solve both problems, a fog signal building with an attached octagonal light tower was completed near the fog bell in 1908 at a cost of $9,381, and a new dwelling was added in 1909. 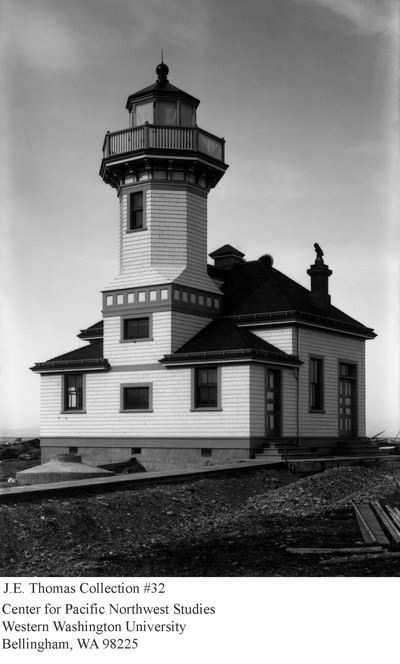 The new lighthouse was designed by Carl Leick and was identical to the one built at Cape Arago, Oregon around the same time. The lens was removed from the 1865 Ediz Hook Lighthouse and placed atop the new lighthouse, and the light source was changed from a mineral oil lamp to an incandescent oil vapor (IOV) lamp. 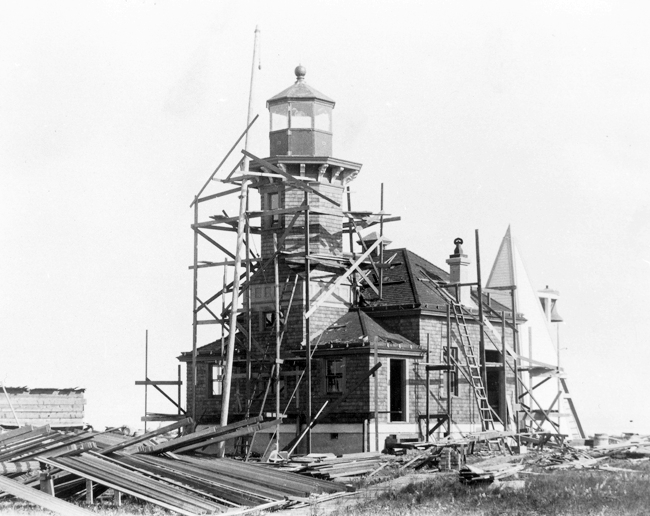 The tower and lantern room were removed from the old lighthouse, and it was remodeled and continued to serve as a dwelling together with the new residence built next to it. The fog signal plant installed in the new lighthouse consisted of two eighteen-horsepower oil engines and air compressors used to sound a first-class automatic siren. 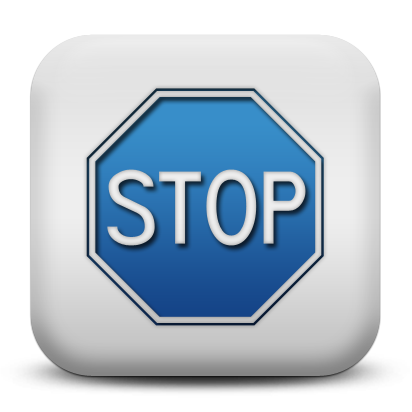 A five-second blast was produced every forty-five seconds when necessary. Keeper Jesse E. Thomas served at Ediz Hook for more than a decade, and in 1918, he was awarded the lighthouse efficiency flag for having the best-kept station in the district. Besides looking after the light and fog signal, Keeper Thomas was also prepared to launch the station’s boat and help anyone in trouble near the station. In 1917, he and his assistant towed a disabled boat with two men aboard to safe anchorage. Three years later, Keeper Thomas rescued a man whose disabled boat was drifting to sea. With the passing of this pioneer, who followed the business of photography while that profession was in its infancy, Port Angeles loses one if its best known old-time characters with whom nearly every person in the city in the earlier part of the present century and last years of the 90's had contact. The albums of every local family that has lived in Port Angeles for 25 years or more contain old pictures produced by him. 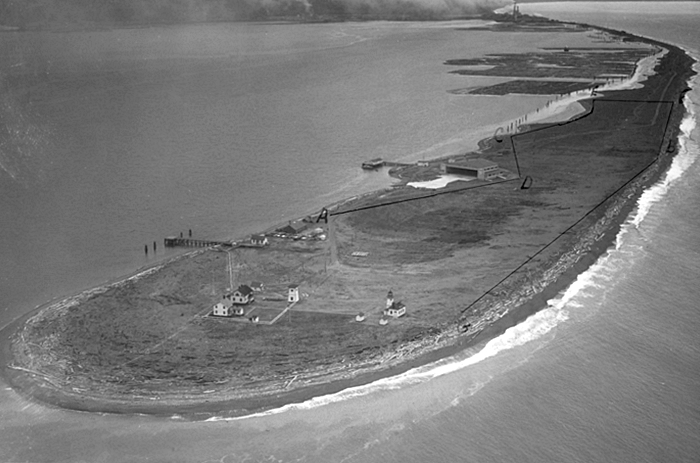 On August 23, 1931, the keepers discovered a fire burning through the dry grass and driftwood on Ediz Hook and starting to threaten the station. The summer had been unusually dry so there was plenty of fuel on the spit. After realizing they needed help to extinguish the blaze, the keepers called on the Coast Guard stationed nearby. Even with this additional manpower, the fire continued its march toward the station’s structures, and a pumping engine had to be summoned from the Port Angeles Fire Department to douse the fire. 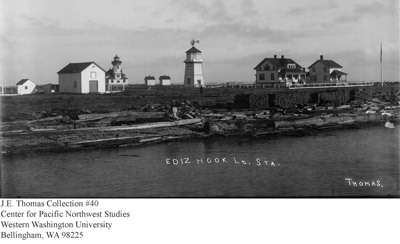 The second Ediz Hook Lighthouse also had a lifetime of roughly four decades. 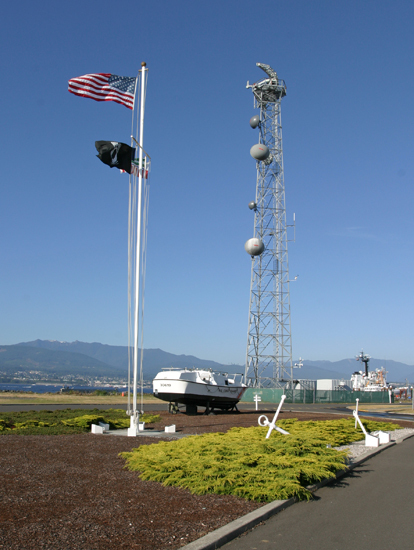 It was replaced in 1946 by a modern beacon positioned atop the control tower at Coast Guard Air Station Port Angeles, which had been established near the end of Ediz Hook. 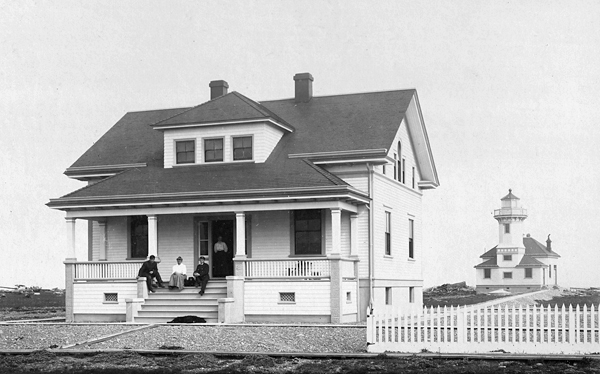 The 1908 lighthouse was subsequently sold and barged across the harbor to Port Angeles, where it is still used as a private residence. 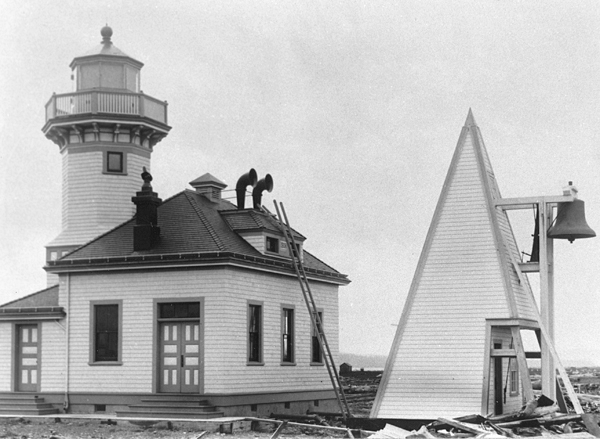 The original lighthouse was torn down in 1939. Head: George K. Smith (1864 – 1870), Mary L. Smith (1870 – 1874), Laura P. Balch Stratton (1874 – 1885), Joseph E. Evans (1885 – 1887), Franklin Tucker (1887 – 1896), James Barry (1896 – 1897), James F. Barker (1897 – 1900), Axel Rustad (1900 – 1907), Jesse E. Thomas (1907 – 1923), Albert Beyer (at least 1924 – 1932), Criss C. Waters (1933 – 1951). 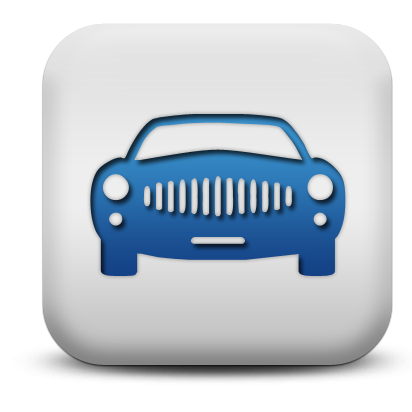 Assistant: Cynthia Smith (1864 – 1865), Nancy B. Smith (1865 – 1869), Frederick Tonnas (1869), Mary L. Smith (1869 – 1870), Ella Smith (1870), Thomas Jackman (1870 – 1871), Andrew Abernathy (1871), George K. Smith (1871), Ella Smith (1871 – 1873), Marcellus Hantoon (1873), Laura P. Balch (1873 – 1874), John Dunn (1875 – 1876), Thomas Stratton (1876 – 1885), Albert G. Draper (1885 – 1886), James Barry (1886 – 1896), Bernard B. Meagher (1896 – 1900), John Dunphy (1900 – 1903), Jesse E. Thomas (1903 – 1907), Gustaf Osterberg (1907 – 1909), George L. Lonholt (1909), Gustave A. Ellingson (1909 – 1910), E.A. Thomas (1910), Bernard B. Meagher (1910 – at least 1913), Henry J. Williams (at least 1915 – at least 1917), Roy M. Avery (at least 1919), Owen H. Wayson (at least 1920), Arthur J. Woods (1921 – 1923), Elmer E. Trask (at least 1924), William R. Christensen (1927 – 1929), Ole Rasmussen (at least 1930), Criss C. Waters (1931 – 1933), Albert Beyer (1935 – 1939), Charles B. Hall (1939 – 1940), Arthur C. Shaffer (1946 – 1948). 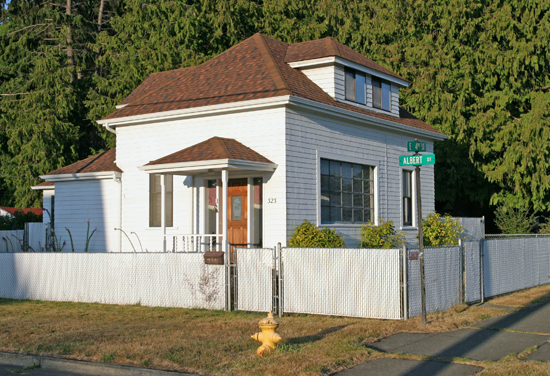 Located on the corner of Fourth and Albert Streets in Port Angeles. 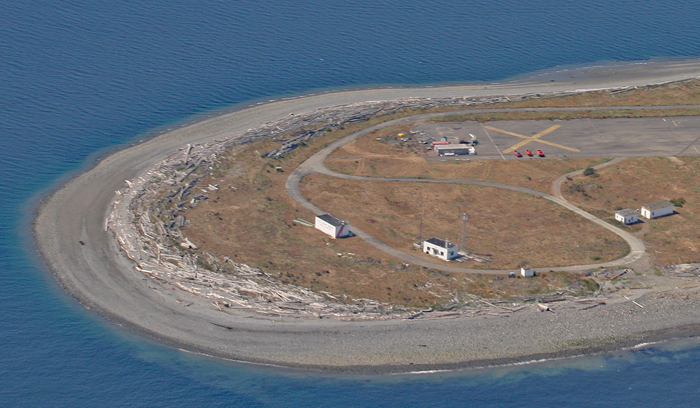 For a larger map of Ediz Hook Lighthouse, click the lighthouse in the above map. From Highway 101 in Port Angeles, turn south on Albert Street and follow it to Fourth Street, where you will see the house that was the Ediz Hook Lighthouse. The dwelling is privately owned. Grounds/dwelling closed.